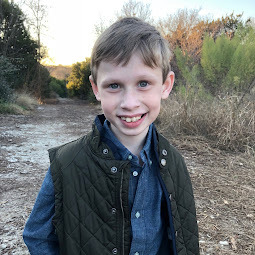 Bennett Brinson Gamel: Fighting Cystic Fibrosis: After sick, there was Sic 'em! 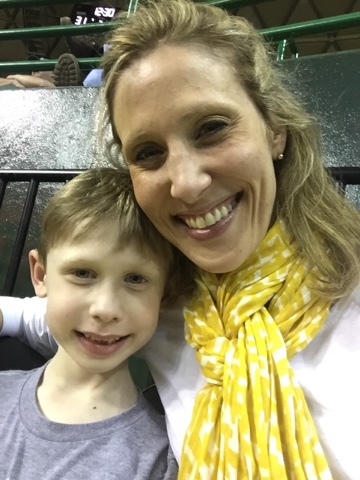 Several weeks ago, on a quiet Friday afternoon the day after Bennett got out of the hospital, the doorbell rang. I was the in backyard pushing Avonlea and Bennett in the swing when I heard Oliver yell: "Somebody is here! And they are holding a ball!" 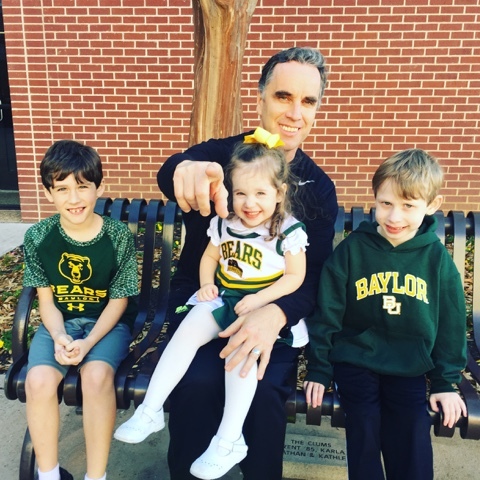 Thankfully, everybody was dressed (not always the case when you have a toddler) as we opened the door to find an outgoing man with a quick speaking northeastern accent wearing a BU shirt and holding a Baylor basketball in his hands. This man, who we had never met, seemed to know each of us by name. But he was looking specifically for Bennett. The tall man introduced himself in a way that would delight any child, "My name is Timothy. Can you say baloney? Then you can say my name, Timothy Maloney." 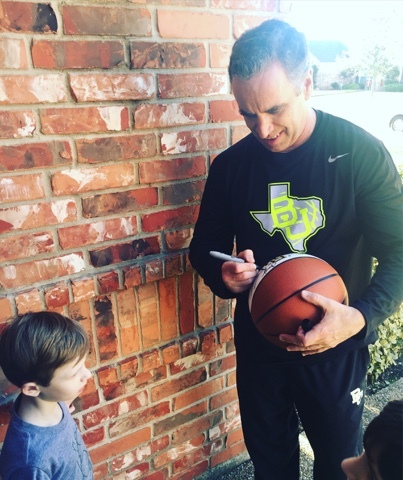 Coach Maloney, as he is known by the Baylor Men's Basketball team, came to our home to bring Bennett a basketball signed by the Baylor Men's Basketball players and then invited Bennett to come to a real live Baylor basketball practice. "Can I come?!" Oliver asked. Coach Maloney touched the top of Oliver head. "Of course you can! Your whole family can come!" 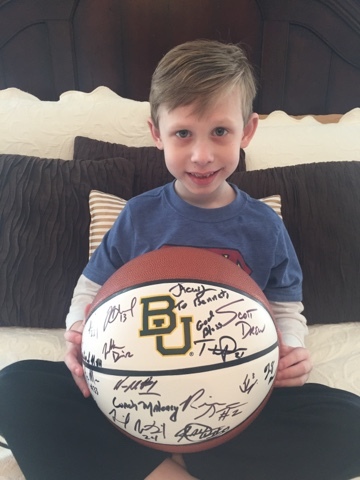 A dear friend and sorority sister had asked me when Bennett was still in the hospital if Bennett had any interest in Baylor basketball. 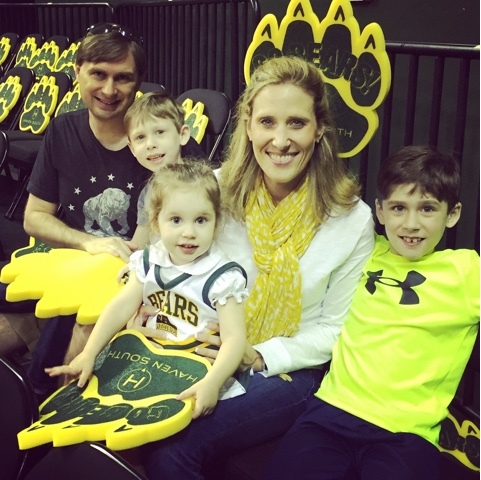 Turns out, she has a close friend who is related to Scott Drew, the Baylor Men's Basketball Head Coach. She thought she might be able to find a way to cheer Bennett up after what he had gone through. I didn't know much more than that until Coach Maloney showed up to our house. Before he left, Coach Maloney said, "call me next week and we'll set up some time to have you guys come to practice" which I promised we would. I had planned to call Coach Maloney on Monday...until it became clear that Bennett wasn't going to be able to go back to school for some time more. Our family was profoundly disappointed that Bennett could't go back to school. It was hard enough that Bennett couldn't see his friends and get in his normal routine. 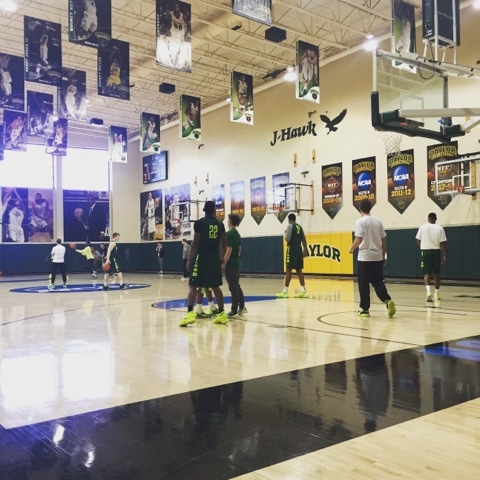 But on top of that, we didn't think we would get a chance to see the Men's Basketball team practice this season. It just added insult to injury. Even this, a very special opportunity, CF seemed to rob. But, upon hearing this, Coach Maloney reassured me we would figure something out, one way or the other, when Bennett felt better again. His reassurance allowed me to put my focus back on getting Bennett better again. Thankfully, Bennett was eventually able to get back to school. So, we scheduled a visit to the Men's basketball practice as soon as we could. 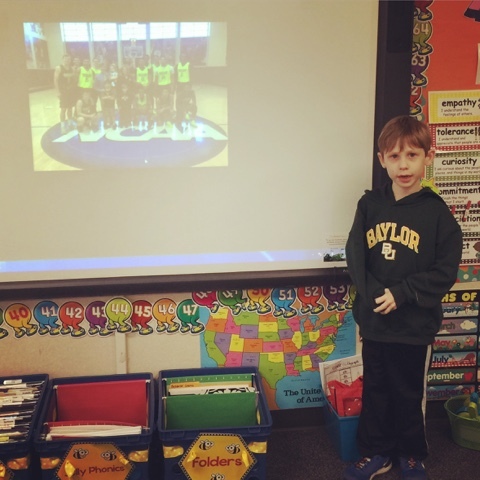 We were so delighted when Bennett did finally feel better enough to go back to school and we finally got to visit the Baylor Bears on their practice court. 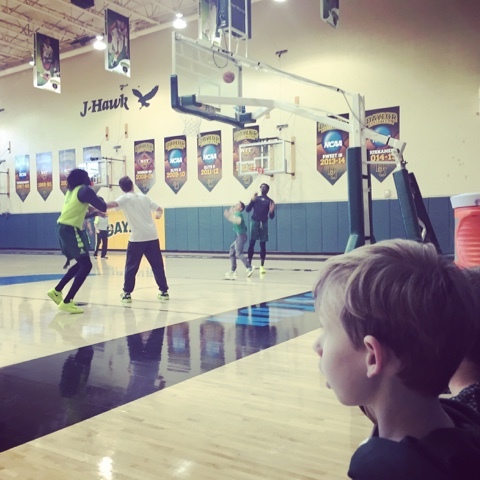 Both boys really enjoyed watching the boys do their drills and scrimmage. Although I caught a giant yawn from 2 year old Avonlea, she had a great time. She kept yelling, "They running! They running!" 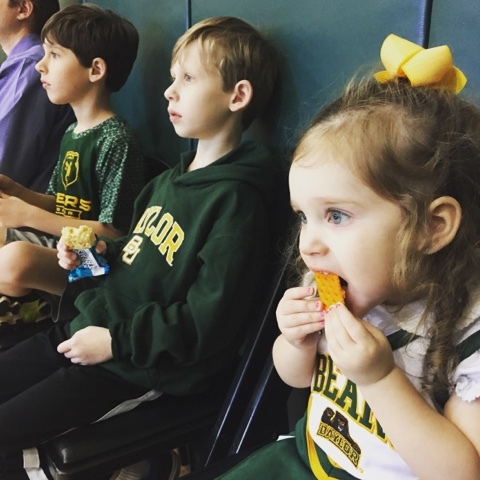 Since practice was after school, the kids were very excited for a snack while they watched their afternoon's entertainment. The basketball players ran and ran for a long time. It was everything I could do to keep myself from offering them something to eat as well! Those guys work HARD! Throughout the practice, when the players stopped to drink water, they would come, look us in the eyes, shake our hands and say hello. It was SO kind. We felt so valued. Here we were just coming to watch them, like flies on the wall, and it turned out they felt us important enough to stop and meet. I don't have a picture of this (although it will always be seared in my memory) but at the end of practice, the basketball team (players and coaches) huddled together in a circle and end in prayer. 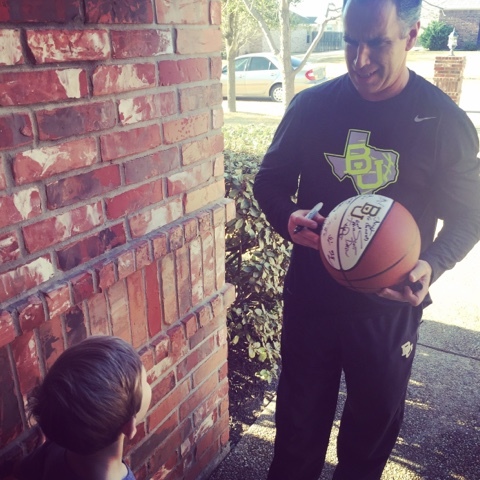 When they gathered together, Coach Maloney turned to Bennett and welcomed him into the circle. Then, Coach Maloney turned to the rest of our family and asked us all to be a part. He said, "come on all of you guys, you are a team." I loved hearing that because there might have been no other time I have more felt this but when Bennett was recently in the hospital. 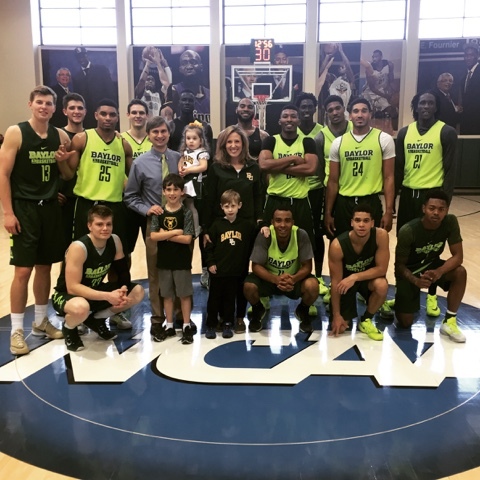 As we gathered our team and joined with the Basketball team in their huddle, Coach Drew acknowledged us and turned to Coach Maloney to share about Bennett's fight with CF. Coach Maloney shared with the team what a strong guy Bennett is and then closed out the practice in prayer. Afterwards, we were asked if we would stand with the team for a picture. It was SUCH a special experience overall. In fact, the next day in kindergarten, Bennett stood in front of his class during "Show and Tell" to tell how happy it made him. 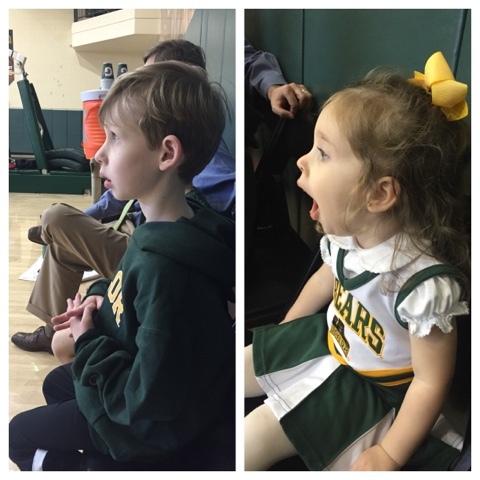 A few days later, after seeing a practice, we decided to bring the kids to an actual Baylor Basketball game, which they had never had a chance to go to. But the only last minute tickets were able to snag were in the nosebleed section. Upon hearing we were coming to the game, Coach Maloney came to visit us right before the clock started, which was such so fun. But when he saw we were in probably the worst seats possible, he said "I'm going to try to get you guys back to a game in better seats." And so he did. 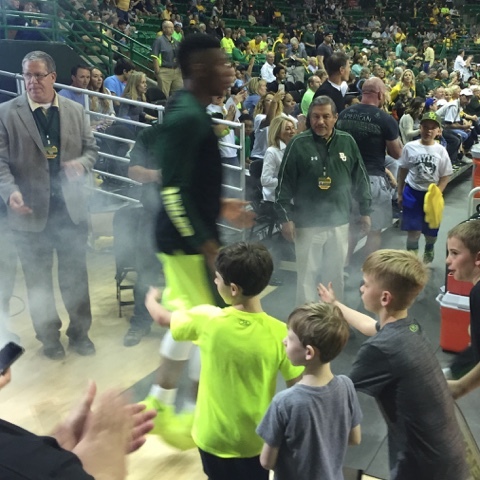 For the very last game of the 2016 Baylor Basketball season, we had seats that were practically on the floor. And they were FUN!! We sat close enough that Oliver and Bennett were able to get out of their seats to give high-fives to the players as they were introduced. 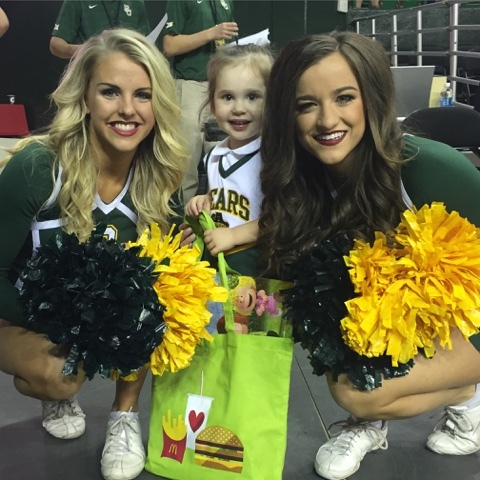 We got there early enough that Avonlea had a chance to meet with some of the Baylor cheerleaders which made her happy. We had such a wonderful time together Bennett still had to go to the bathroom a million times. But it was so worth it! 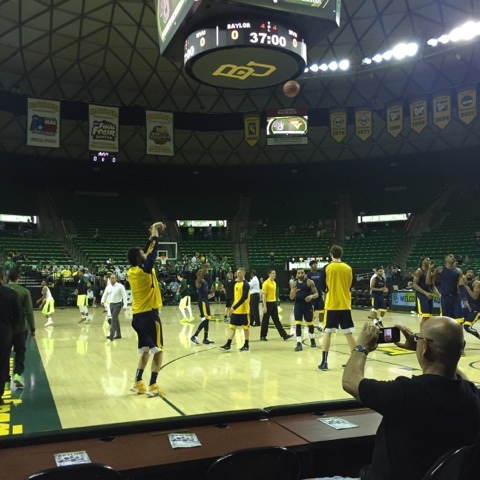 Getting so close to see the Baylor Bears play was a fun immersive experience. Love feels pretty amazing after loss. Having such a fun unique and special experience offered to us by the kindness of strangers was so meaningful after having been through several weeks of hell. 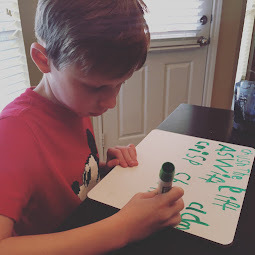 I was exhausted from having to watch my son suffer. Bennett was tired of being poked and feeling badly. Avonlea and Oliver were over having to be away from their parents. And Brian longed for normalcy. This experience was a family experience that brought us together and gave us something new and exciting to think about. Time slows during the good moments, just as it does during the really horrible ones. 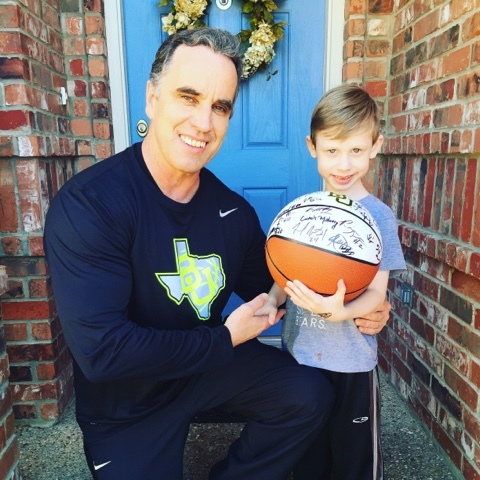 When we were visiting with Coach Maloney, watching the team practice or attending a game, it felt like time slowed. We were able to enjoy sights and sounds. We were able to be fully present in an experience that felt bigger than us - both of which made it feel like time somehow slowed. The same thing happened when Bennett was in the midst of his pain. Time slowed way down. So, it's nice to be able to counteract that slowed time of being in the hospital, feeling lonely, experiencing pain with time doing something we enjoyed, feeling included and experiencing joy. Making good memories is especially important after which point bad memories have been made. Bennett's last hospital experience was pretty horrible. And one of the things that saddened me the most was that Bennett is now at the age where he will remember it. 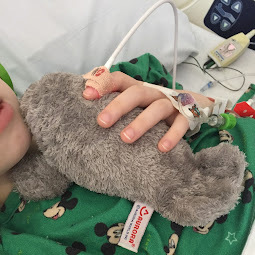 It's one thing when your child is hurting but he's too little to remember. It's another when you know he knows what's going on and won't likely forget it. "Will it affect him? Yea. What will he remember? 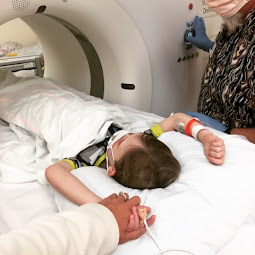 How in the horror of the hospital experience, you and his dad were his relentless comforters and companions and advocates -- and never left his side. How he wasn't in any of this alone. How it was a family journey. How home is where the family is. How through the worst pain and fear and agony, we can survive... and rise and thrive again...you have to remember, this will be just one memory of one experience in a quilt of many more. And most of those other ones will be wonderful patches." This one was a wonderful patch. Tim Maloney, you are part of our family now! Thank you for opening your heart to us. We love you! Coach Drew, Jane and Amy, thank each of you for hearing and responding to our story. It is your faithfulness that helped bring laughter to some really sad hearts, especially Bennett's. 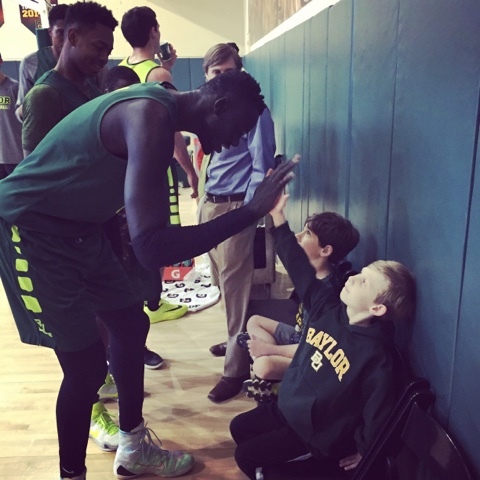 And to the Baylor Men's Basketball team, thank you for reminding us what it means to be a team. Thank you for using your team to encourage and love on ours.